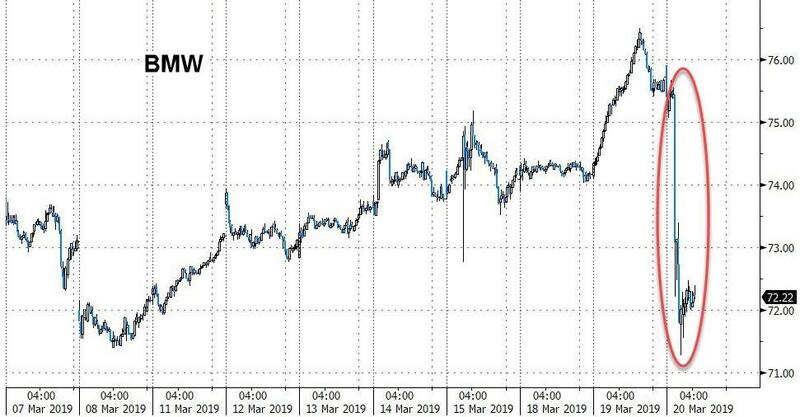 In keeping with the misery of the slowing global automotive industry that we have widely covered over the past year, BMW stunned auto bulls this morning when it warned that its earnings will fall "well below" last year's level. Like a growing number of its peers, BMW will implement strategic business changes and embark on unprecedented investments in electric vehicles. The automaker said that its pretax profit would be down by more than 10% this year. In response, the company is stepping up a savings program with plans to cull certain models and hold its workforce steady. Shares of the automaker fell as much as 5.9% as a result of the announcement. Bernstein's Max Warburton said: "The weak outlook increases concerns about the entire industry, with BMW one of its leading names." The results continue to be a "troublesome sign" for the sector, Warburton said. Over the last few months, BMW has looked as though it was able to buck some of the recessionary trends of the decelerating global automobile market, specifically in China. Now, they look to be in a more precarious position. “This warning will inevitably increase worries about weaker names in the sector,” Warburton continued. Last week, the company admitted that it has a challenging year ahead of it and that "great efforts" would be necessary to push through. Among the concerns are the costs associated with shifting to electric and self driving cars, which will be robust. The company is set to see its automotive profit margin fall to between 6% and 8%, down from an 8% to 10% guidance range and long-term targets set by the company. The company warned that this guidance could get worse if conditions worsen. Chief Financial Officer Nicolas Peter said: “Our industry is witnessing rapid transformation. A sustained high level of profitability is crucial if we are to continue driving change." 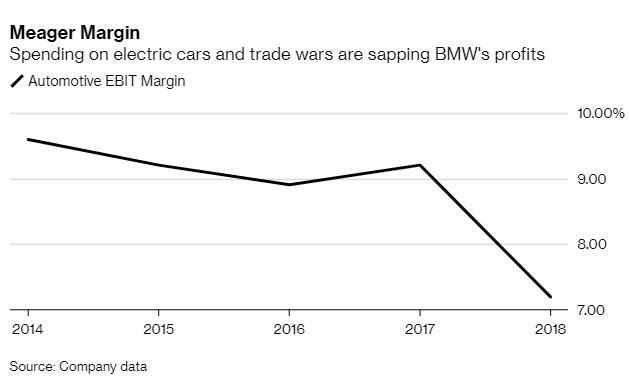 In light of the company's tumbling EBIT margin as BMW boosts spending on electric cars, that is proving to be an increasingly bigger challenge. The company has also been negatively affected by trade concerns, as tariffs on vehicles being made in South Carolina and shipped to China have caused earnings to suffer. Concerns over Brexit also exist, and the company has said it may move production of its Mini from Oxford to elsewhere in Europe, should the UK leave the European Union without a deal. President Trump is still mulling additional tariffs for automakers in Europe. BMW's deliveries were down 2 percent through February as the European market fell for a sixth straight month. The company also said that stricter carbon omissions, currency swings and higher raw material prices will have a "three digit million Euro" negative impact on its earnings. Despite this, China, the company's biggest market, is expected to see "solid growth this year" according to the company's head of sales. We'll see how long that "silver lining" guidance lasts.